“Ready Player One” (RPO from here on out), based on the eponymous Ernest Cline novel, is set in an imagined 2045 when an exploding population is slavishly addicted to a virtual reality space known as the ‘Oasis.’ At the passing of the game’s hugely influential creator Halliday (played with on-the-button quirkiness by Mark Rylance), he bequeaths an intentionally Willy Wonka style challenge to all patrons of the Oasis. Players must find the three hidden easter eggs within the game and win half a trillion dollars (vis-à-vis that Facebook money SON!) and sole control over the platform. 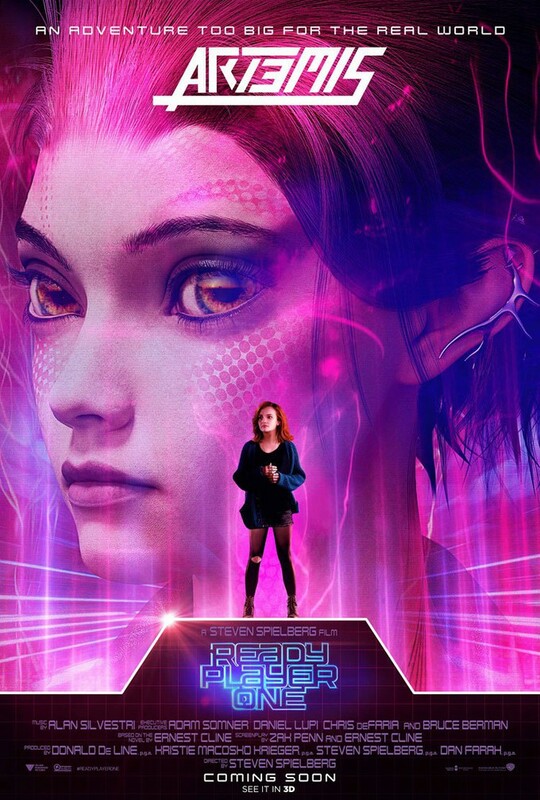 Amongst rabid corporate interests and armies of interconnected players, Parzival (the in-game avatar of Tye Sheridan's Wade) may have the skill and the obsessive pop culture knowledge to solve this puzzle. Rather than the fever pitch irrational fears that felt omnipresent in social media timelines about the near nostalgia exploitation conducted by this movie marketing team, Spielberg - as he’s done for four decades - is able to consistently find the human 'co-op mode’ in this potentially bland outing. “Ready Player One” is able to stage the story structure alongside the search for each key search easter egg, the stakes grow as games do, levelling up from "n00b" to "insane mode." The central crew of players, who we mostly interact with via their in-game avatars, don't glitch out with Spielberg at the controls. Sheridan, Olivia Cooke (playing Art3mis / Samantha), Lena Waithe (Aech / Helen), Philip Zhao (Sho), Win Morisaki (Daito) are in Hollywood's safest hands as younger performers. Ben "Mendo" Mendelsohn loves chewing scenery as Sorrento, the blatantly evil corporate parasite. He's the living embodiment of one of those viruses that spam you with ten million unwanted ads. Spielberg's current muse Rylance is flat out obtuse as Halliday. There's a strange duality in RPO that I wrestled with in the viewing. The roots of which are the two poles of Spielberg's work. His intimidating resume is frontloaded with some of the greatest blockbuster films ever produced. His later works are morality plays centred around our species' collective impulse to self-destruction. Sporadically saddling these two extremes are works like Jurassic Park, Minority Report and War of the Worlds. This trio is not only rapturously entertaining, but they make time to focus the audience on the perils of innovation without ethics, about the relentless struggle with tempering technology with philosophical reason and about the collective human experience. RPO has those glimpses. It establishes a world context where American society (and I'm guessing Western culture more broadly) gradually ignores fundamental needs, slips effortlessly into poverty. The oasis could be a cipher for the “Matrix.” What’s fascinating in the world of RPO is that crippling overpopulation, an exploding lower class forced to live in vertical groves of trailer stacks increases the impossibility of escape. This virtual world is the powerful opiate that keeps these masses passively accepting the status quo. When the film doesn't engage with that philosophical conflict, one can't help but scratch your head. Perhaps RPO is a case of viewers and critics, myself included, having a favourite Spielberg and looking for him behind the lens. The Spielberg at the helm of RPO is preoccupied with wielding a wild concoction of 80s pop culture nostalgia into a kind of narrative "Twitch" movie. And in that alone, RPO succeeds.